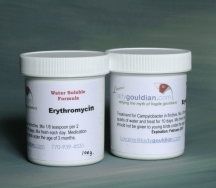 Erythromycin is the only treatment that I have found to be effective against Campylobacter in Gouldians and Society Finches. 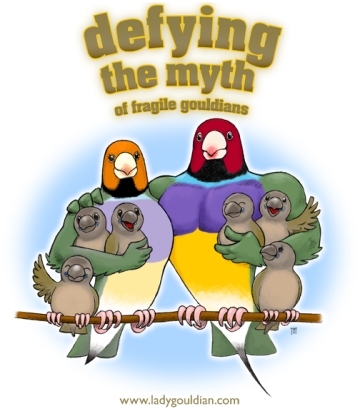 It is not a safe medication to use on chicks younger than 6 months of age, so if Campylobacter is suspected in Society Finches used to foster Gouldian chicks, the Society Finches should be treated during the time the eggs are being incubated, and not again until the chicks are weaned and removed to another cage. Dosage and Administration: Mix ¼ teaspoon into 1 gallon of drinking water (or 1/8 teaspoon into 2 quarts). Treat for 10 days and be sure to mix fresh daily. Mix only enough that will be consumed in one 24 hour period. Do not mix and hold for next day use. Note: If you need to mix 1 liter/quart each day, the 50g jar will be enough for 40 days of treatment.